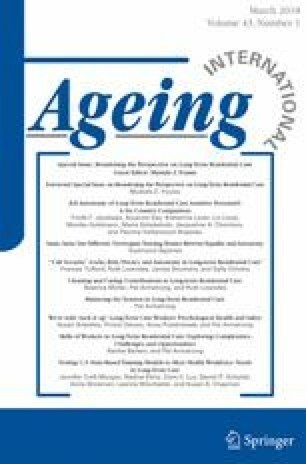 This pilot study analyzes interview research with long-term residential care nursing staff in four Canadian provinces, revealing relationships between workers’ psychological health and well-being and working conditions that include work overload, low worker control, disrespect and discrimination. Further, individual workers are often required to cope with these working conditions on their own. The findings suggest that these psychological health and safety hazards can be addressed by both individual workplaces and government regulation, but are currently ignored or mis-recognized by many employers and even by workers themselves. These findings indicate opportunities for improving psychological health and safety in long-term residential care work. We are grateful for the support of the Social Sciences and Humanities Research Council of Canada (Re-imagining Long-Term Residential Care: An International Study of Promising Practices) and the Canadian Institute for Health Research and the European Institute on Ageing (Healthy Ageing in Residential Places). We are indebted to the Principal Investigator on these projects, Pat Armstrong, and to the co-investigators, for their encouragement and ever helpful critique. Special thanks to Albert Banerjee for his engagement with this research. As there is no person or personal data appearing in the paper, there is no one from whom a permission should be obtained in order to publish personal data. The studies described in this article received ethics review and approval from university and institution-specific Research Ethics Boards. Fujisawa, R., Colombo, F. (2009). The long-term care workforce: Overview and strategies to adapt supply to a growing demand. OECD Health Working Papers, no. 44, OECD. doi: 10.1787/225350638472. Public Services Health and Safety Association. (2016). Mental Health Resources. Retrieved 15 July 2016, from http://www.pshsa.ca/mentalhealth/. Quality Palliative Care in Long Term Care Alliance. (2012). Personal Support Worker Competencies. Retrieved 10 July 2016, from www.palliativealliance.ca/.../QPC_LTC_PSW_Competency_Brochure_Final_May_2_2012_V2_1.pdf. Sabo, B. (2011). Reflecting on the concept of compassion fatigue. Online Journal of Issues in Nursing, 16(1). http://www.nursingworld.org/MainMenuCategories/ANAMarketplace/ANAPeriodicals/OJIN/TableofContents/Vol-16-2011/No1-Jan-2011/Concept-of-Compassion-Fatigue.aspx.